1. 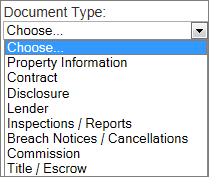 From the desired property, click the Documents sub tab at left. 4. Click the Browse button. Locate the file you wish to add and double-click it. If you wish to add additional files, repeat this step for each file. Note: To remove a file, click the red X shown in the screen shot below. To remove all files, click the Clear List button, also shown below. 5. 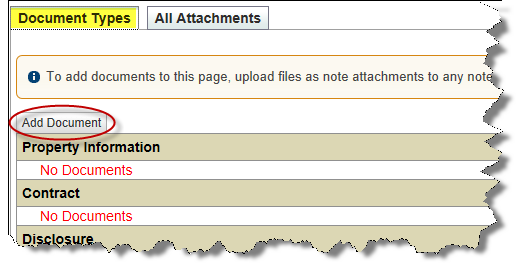 At the bottom of the Add Attachment screen, you will see a field called Document Type. This field is required in order to attach the document. The Document Type determines where the document will reside within the Document Types sub tab. To specify a type, click the drop-down arrown arrow located next to Choose... (as shown below) and click on the desired type. You may only select one document type. This means if you are attaching multiple documents at once, they will all be "typed" the same. If you wish to attach multiple documents with different Document Types, you need to repeat this process for each different type. 6. 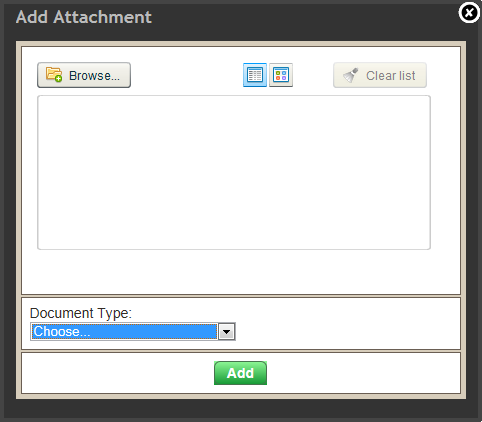 After you specify a Document Type, select the green Add button. Your document will now appear on the Document Types sub tab in the section you specified in the previous step.